The Nigerian Tag questions are a series of simple questions and answers that help you learn more about a Nigerian and the whole country at large. Nigerians are present in almost every part of the world, and generally, they are smart and fun loving people. So, no one can fault your curiosity for wanting to learn more about Nigerians and their country. 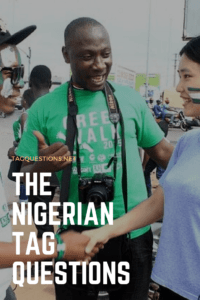 If you are a Nigerian, especially if you are a blogger or vlogger, the Nigerian question tag is an excellent way to introduce your country to your audience. Do you live in Nigeria? Or have you ever lived in Nigeria? What is the meaning of your traditional name? What’s your favorite Nigerian song? What’s your favorite Nigerian movie? Who’s your favorite Nigerian Personality? What Nigerian language do you speak? What is the best way to identify a Nigerian? What is the best-kept secret about Nigeria? What is the biggest misconception about Nigerians? What do you love about Nigeria? What do you dislike about Nigeria? What do you say when the power comes on? You’re going to a military-themed party close to the army barracks in Nigeria, are you wearing a camouflage shirt? The IV says all guests should be seated by 10 am, what time are you arriving? What do you say when you’re doing a sound check? What’s Nigeria’s official party food? What do you eat when you’re broke and hungry? What’s the Nigerian term for a commercial motorcycle? How many cubes of sugar do you put in your Garri? Your aunt is visiting from the village what traveling bag is she carrying? What do you call tissue paper? How do you open a bottle of soda? India vs. Nigeria, who won, what was the scoreline and who scored for Nigeria? What is the general term for drinks like Coke, Fanta, Pepsi, Mirinda? You have visitors, what’s your momma sending you to buy? Results are out; you were 2nd in your class, what’s your mom’s comment? Pronounce the following words: Oil, Yam, Ear, Happy, Teacher, Faster and Junction. Like every other tag, the Nigerian tag questions are a series of questions and answers that are particular and familiar to Nigerians that stayed in the country or know the country well enough. Although, these versions of the tag are a bit different because up until now, there was no definitive list of Nigerian Tag Questions. Notwithstanding, here are videos of the Nigerian Tag. That’s it, folks, remember to take the Naija tag and tag your other Nigerian friends.